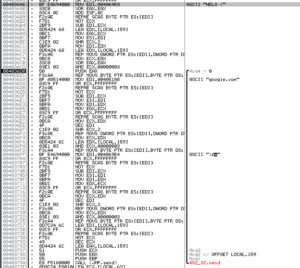 I tried working on unpacking the file found in the .rsrc section of the Pepex variant that I analyzed, and had mixed results. I first tried a couple of things like simply looking for a far jump in a disassembly (like with UPX), which didn’t work. I can’t say I’m too surprised, but I figured I would give it a try. I tried running the original malware and then patching the code to force the branch where the file is loaded and executed, but the file that drops is just the packed file from .rsrc (in this case, dropped as %system%\system32\LSASvc.exe). So, it clearly knows it’s being messed with. Not sure if this had something to do with what I was trying to do in the debugger, or if it just didn’t like being taken out of the .rsrc section of the overall malware. I see the 4D 5A magic numbers and then dumped from there. I ended up dumping the file three ways – used each of Olly’s methods of reconstructing the PE header, and then also without reconstructing it. What I ended up with was a somewhat unpacked file from the .rsrc section and then the file from the .rsrc section that was created after patching the code to follow that branch (which is what I had originally gotten from the .rsrc section running Resource Hacker). VirtualAlloc, CreateThread, VirtualFree: These are some functions associated with process replacement. I’m not seeing others (such as ResumeThread, WriteProcessMemory, etc.) but perhaps I’m just not seeing them in this file because of the way it was unpacked. This is something to keep in mind as I take a look at what this executable does when run by the parent malware. WriteFile, DeleteFileA, ReadFile, CopyFileA: I’m always happy to see these functions because it tells me there might be some obvious file system artifacts to look for, but it also makes me wonder if this file copies an existing, legitimate file somewhere else (such as a temp directory) and then does some sort of MiTM thing. GetSystemDirectoryA, GetTempFileNameA, GetTempPathA: Related to the thoughts above regarding replacement of a legitimate file. I wonder if something happens like: 1) copy legitimate file to a temp path 2) replacement legitimate file with malicious file 3) malicious file receives input from system first before passing on to the legitimate file now residing in the temp directory so that nothing seems amiss. FindFirstFileA, FindNextFileA: Looks like this thing will look for a specific file. GetComputerNameA, GetVersionExA, GetDriveTypeA: Makes me think of some sort of system inventory. CreateProcessA: Will be interesting to see what, if anything, this file creates with a call to this function. CreateServiceA, StartServiceA: Another interesting clue that some of the other strings here might relate to a service name that this file uses when it creates a service with itself. Looks like the first two are some error messages specific to this sample. After that I’m going to guess that when this calls CreateServiceA and StartServiceA it calls itself LSAService/Microsoft LSA Logon Authorization Service. Next we see what appears to be some sort of system inventory creation text. I’m going to try to get this to run and see what happens dynamically. pProcessInfo: Pointer to a PROCESS_INFORMATION struct that receives info about the new process. In this run this value happens to be 18FB44. InheritHandles: In our run, this is set to FALSE, so no handles are inherited from the main malware process. pThreadSecurity: Set to NULL, so handles to the new thread cannot be inherited by child processes. pProcessSecurity: Also NULL, so handles to the new process cannot be inherited by child processes. 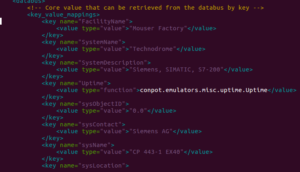 CommandLine: The command line to be executed, which in our case is the string from above – C:\Windows\system32\lsasvc.exe -i (though on our system that’s the SysWOW64 directory since I’m running this on a Win7 VM). The -i argument is interesting. Maybe this means “-install”? I wonder if there is a corresponding -u or -r argument. ModuleFileName: NULL, so “…the module name must be the first white space-delimited token in the lpCommandLine string…”, therefore lsasvc.exe. Per MSDN, the service Type (0x00000010) is a Win32 program that can be started by the service controller. The Start type (0x00000002) indicates that it should automatically load at startup. This looks to be how this other file achieves some persistence and also stealth as it tries to masquerade as a legitimate-sounding service. Process Explorer and Process Monitor let us observe that the call to CreateProcessA spawns an LSASvc.exe process (PID 1160) and then that process terminates with another LSASvc.exe process being created (PID 2816). This new process (2816) starts listening on port 186. This is pretty interesting, because the parent malware didn’t appear to have any C2 functionality, and this might indicate how the malware can be worked with remotely. I tried to fix the dumped file with LordPE and ImpRec, but still had issues with the file so I’m probably going to leave it be, at least for now. There were some interesting things going on in this file, though, so I’ve updated the report from the last post and am including that here. Please let me know if you have any thoughts on any of this, particularly on unpacking Petite! MAY BE INFECTED BY A VIRUS! I spent the morning sorting through samples from all the GRAB honeypots, and settled on a sample that happened to come in via the NYC honeypot. 50/53 detection ratio on VirusTotal, so let’s look into it in more depth. Looks packed to me, but not UPX like the last sample. 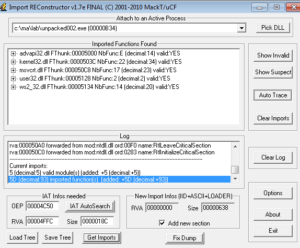 PEiD identifies the packer as Upack 0.39 beta. I opened the file in PE Explorer and that automatically unpacked the malware (revealing many more strings than before), but I am going to take a shot at manually unpacking it anyway. I watch the malware call LoadLibraryA seven times, ending with Mpr.dll, and then hitting run again causes it to run and not hit the breakpoint again. Restoring the VM snapshot, I go back to where Mpr.dll was called and then set another breakpoint on GetProcAddress, and then run through that five times until it appears that GetUserNameEx is the final function called with GetProcAddress before the rest of the program runs and the second breakpoint is no longer hit. Checking this against the automatically unpacked file, this is the entry point area. 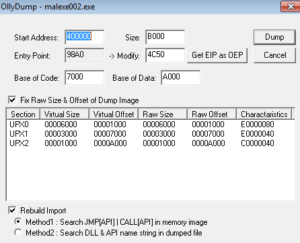 What’s sort of strange is that whether I dump this process from the other address above (756AA4E9) or the one right here (4023A0), I end up with basically the same dumped file and OllyDump can’t do anything with the import table. ImpRec doesn’t work either, and either way I’m left with something that doesn’t function but nevertheless offers a lot of interesting data statically or in disassembly. Since I was successful with the automated tool, I’m going to move on to static analysis of the unpacked sample that I obtained with PE Explorer. I don’t typically see a .code section, but this must be the equivalent of the .text section containing the sample’s code. I also don’t usually see .idata, but this should have the import function info which I’m more accustomed to finding in the .rdata section. I’m guessing that something is contained in .rsrc, but we’ll get to that later. I wonder if this is being used in some fashion to “construct” IP addresses. I notice that some of the “special” numbers like 239 and 255 are not included in this list, though if this is what it’s being used for, one would think you’d see numbers below 130 also. These could also be ports. That SMTP server is an exact string from the Pepex sample I took apart previously. Those other addresses could make for some interesting signatures once we get to that point. After this, we see many strings of inexcusably horrendous passwords (crap like 1234, angel, password, passwd, BUMBLE, asdf, asdfgh, 4321, db2admin, and so on). This looks EXACTLY like some of the info pulled from Pepex. We see the same email addresses in use as in that other sample. The 209.85.133.114 IP address points to Google. I’m starting to think that this is a Pepex variant, if it wasn’t already pretty clear. Strangely, the antivirus products weren’t too consistent in naming this sample when scanned, though I recall that one of them did identify it as Pepex. I wonder if that lsascv.exe file is what the sample uses to install itself and achieve some stealth, and the Windows Genuine Update string points to additional stealth / persistence methods. Again, something to keep in mind. This might do something with lsass because of lsass’ privilege levels and API access. 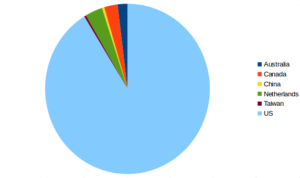 Finally, that Subject: %s|%s|%s is the same string we saw in the other Pepex sample for constructing the spam subject line. I find it interesting that this is the same list as in the other Pepex sample, however Win7 is not here (which I wouldn’t expect from a sample created in 2004). Perhaps the reason why we had so many problems with the other sample was because someone tried updating the code and screwed up. Looks like we have another file inside. I’m not sure what a .petite section is but it’s not a normal section like .text, .rsrc, .rdata, or others. Some weird error messages follow, so perhaps this is a packed file within the previously packed malware. After that I see a handful of process names and library imports, so I think we’ll need to continue digging to get to the bottom of this. original incase[sic] you should want to go back to it at any time. RegOpen/CloseKeyExA, RegSetValueExA, Create/Open/Start/DeleteServiceA: Based on these imports and the prior work done on the other Pepex variant, I’m guessing that this is used to both achieve persistence and also start the malware as a service. CopyFileA, WriteFile: I see a call to CopyFileA but not to DeleteFileA, so maybe this file makes a copy of itself and then deletes itself some other way when it installs. This also could mean that this file relocates some system file so that it can put itself in between the user and the legitimate file (maybe it gets in between lsass.exe, for instance). I suppose that one clue that this is not the case is that I don’t see any exports, but we still don’t know how the file from the .rsrc section functions yet. WriteFile is always good for looking for file system signatures. 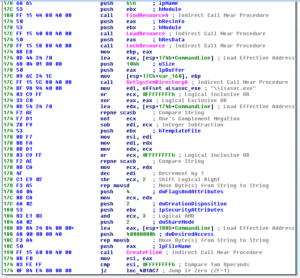 WaitForSingleObject: perhaps this malware creates a mutex. CreateProcessA: Always good for signatures, and also this means we’ll need to look out for child processes of this main malware process. Could possibly also be used to load drivers. The interesting thing here is that I’m only seeing client-side functions imported (socket, connect, send, recv) but not server-side functions (like bind, listen, accept). For the dynamic analysis, I ran and recorded the packed malware two times – once as a regular user, and once as an administrator. 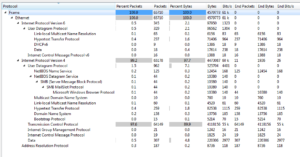 Watching the run as a regular used showed a ton of activity taking place in Wireshark. RegShot didn’t reveal much going on. 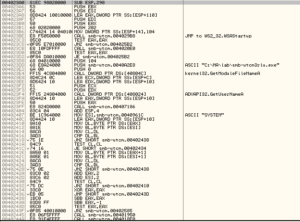 There was a UserAssist value added under HKU, but other than that, no other changes in the registry or file system that could be linked to the malware (speaking strictly from the RegShot perspective). 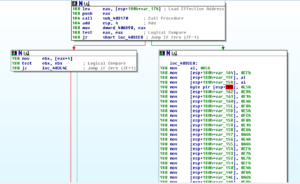 Process Explorer revealed only the single malware process being created (PID 2576) but nothing else. It could be we missed other stuff happening in Process Explorer, so we’ll look at Process Monitor and other places too. I’m not seeing anything in Autoruns, so perhaps persistence wasn’t achieved. We see traffic on some broadcast IP addresses and on ports 137 and 138 which, for UDP, are associated with SMB also (NetBios API). 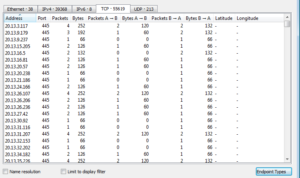 There’s also traffic on port 1900, which is the UPnP port that we saw a lot of action on in the honeypot statistics. 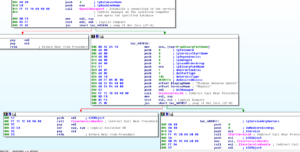 Reviewing the recorded malware activity that was run as an administrator didn’t reveal any new or different behavior. The same activity both on the host and the network was observed. Then, later on in this sub, we see the file being written and then a process being created from it. 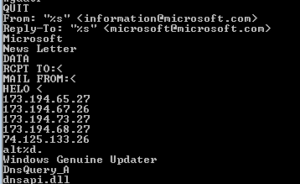 This also makes for a nice host signature under “SOFTWARE\Microsoft\Windows\CurrentVersion\Run”. Before getting into 401210, I’m going to take a quick look at the alternate branch that this sample seemed to follow when I ran it in my test environment. This is the branch that was taken at the conditional jump at 40243F which branched us away from the installation/system inventory/email generation branch and instead did the IP scanning and thread creation. Note that I displayed the number in base 10 for clarity. “Windows Genuine Update” and “Wupdate” are nice signatures to be aware of. What it looks like is happening here, is that the string “john@barrysworld.com” is pushed onto the stack twice, and then these two strings are compared with a call to strcmpi (which is deprecated according to MSDN). Then, there is a conditional jump based on this comparison – If the strings are the same, then the function should return 0 and therefore this conditional jump should always be followed in this instance, which would take us down the branch on the left. If anyone out there has a better understanding of what is going on here, please let me know, as it appears that we have a situation where there’s a condition jump that is never followed. 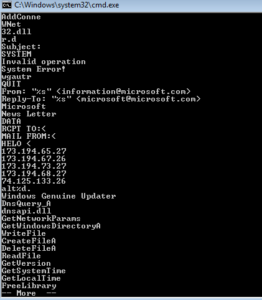 In any case, on the left branch, we see some more signatures that were common with the other Pepex variant analyzed (microsoft@microsoft.com, information@microsoft.com). At this point, I’m done looking at this sample. As we’ve seen, it’s closely related to a prior sample, except that this one actually seems to work so we were able to observe more functionality. 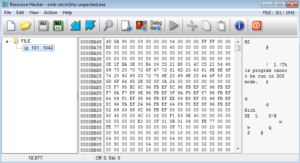 I might take a look into manually unpacking the file in the resource section since this is a packer that is new to me and this might make for an interesting analysis. Mass-mailer worm. Similar to the prior sample analyzed, which I believe was derived from this new sample as this sample did not appear to have the execution issues observed previously. Sample appears to both scan new IP addresses, both for remote and local systems, probably with the intent of spreadnig itself. It also contains functionality around reporting system inventory and sending spam messages. Interesting, old malware. It was good to see this worm running successfully so as to get a better opportunity to view its capabilities. Continuing on the subject of honeypots, I wanted to see if I could get something set up as an ICS/SCADA honeypot. 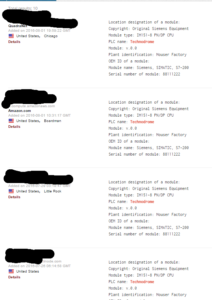 I’ve noticed traffic on some of the GRAB series honeypots that could be Modbus connections, for instance. I’m also pretty interested in ICS/SCADA in general, so I looked into whatever I could find regarding honeypots that I might be able to set up myself. In the end I set up a single Conpot honeypot, and I thought I’d share my notes in case it helped save someone some time. This sounded like it would be the most robust and realistic of all the honeypots that I could find, but I ran into issues during installation. First, the documentation and system is from 2006, so a lot of the instructions are really out of date (for instance, one document referred to installation on an Ubuntu 6.x system). I ran into a few issues while installing dependencies, but I was able to get past those — specifically, instead of xlibs-dev, install libx11-dev, and automake1.11 instead of automake1.9. The real issues came when I tried to install VMware server. This used to be freely available, but isn’t really available anymore from VMware (I’ll explain what I mean by this). The installation instructions from Digital Bond specifies a link to download an old version of VMware server for Linux (1.0.2) and this link still works, however with my current version of Ubuntu (16.04) I ran into too many issues with the installation and just gave up on it. This system came up during searches for these types of honeypots. The info sheet indicates that it handles Modbus and also lists some contact info for creators, however trying to reach out to them resulted in bounced email. Not sure if this is publicly available, and searching didn’t turn up any other email addresses to use to contact them. The overall project page can be found here. I found this one through an interesting academic paper about electric power substation honeypots. They have the source up here. I liked the idea that this would be a module for Dionaea, which meant that I could either add this module to an existing honeypot, or quickly set up a new honeypot running Dionaea (which is very easy) and just use it to run this module. I ultimately ran into various issues during setup, and at this point I was pretty burned out and not interested in pursuing this anymore. If you have more luck, please let me know and maybe I’ll give it another try if you can send me some ideas on what to try. Seems to be working (the xs are in place of my connection info). Don’t be these people. Change your default settings. I found dozens of these honeypots all over the world this way. One note — you might go to change the template settings in the /opt/conpot/templates directory. Per this post, go to /usr/local/lib/python2.7/dist-packages/Conpot-0.5.1-py2.7.egg/conpot/templates [you may have a different version number than I do] and change your templates there. You can test it quickly to be sure by just pulling up your site in your web browser. 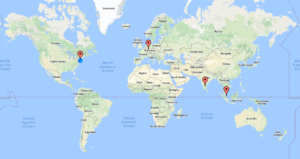 Digital Ocean is not great as a host for this type of honeypot because it’ll show up as such in a search — putting it another way, why would an ICS/SCADA system be on a Digital Ocean VPS, or AWS, or GoDaddy.com? Doesn’t really make sense, but for now that’s what I have so I went with another droplet there. Ideally I’d put this new honeypot somewhere that it might actually make sense to have such a system, but I don’t have access to any such facility. I did, however, look around the area and do a little research on some ICS/SCADA sites, and entered values that should be plausible enough to collect some attacks in the honeypot. I’m not going to post any of that info here as that would potentially ruin the honeypot I set up, but what I’d say is look around the area where your honeypot is hosted and try to create a plausible “identity” for your system. Try to also pick a system that 1) uses Modbus and 2) might actually be in use at your choice of cover story. We’ll see how successful I was at setting this up, and hopefully at some point soon I’ll have some interesting info to share about this new system. I’ve decided to place ICS/SCADA honeypots under the series JUMPSEAT. New sample in from the NYC honeypot – 50/54 detections on Virustotal, so let’s take a look. 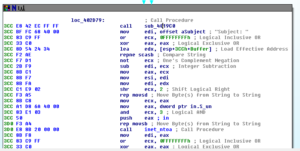 At the end we see a tiny number of function names, along with .dlls such as WS2_32.dll and others. Along the way I saw bit and pieces of a string that suggest that this malware might construct emails, so maybe this malware is spam-focused. Now we can really take a look through this thing. – I see several functions around opening/copying/deleting files as well as functions related to the temp file path. I always like to see these because it implies that there is going to be some file system change taking place that can be used to both construct a signature and also identify the malware objectives. One string recovered was “Isass.exe” which is supposed to mimic “lsass.exe” – perhaps this sample copies itself somewhere as “Isass.exe” as a stealth measure. – WaitForSingleObject appears to be called, so there might be a mutex created by this malware that could also form a signature. – I see multiple functions related to services such as OpenService, CreateService, StartService, DeleteService, that suggest that this might be how the malware achieves persistence and stealth. I saw a few strings earlier that might make for good fake service names to blend in with other, legitimate services running on the host. 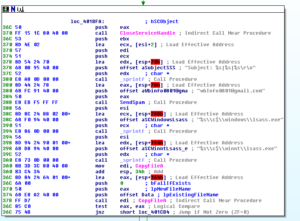 – There is an import of WS2_32.dll and several functions such as connect, socket, listen, bind, send/recv, gethostbyname,WSAstartup, inet_addr and so on that suggest that 1) there is a networking component to this malware and 2) since this is a lower-level networking dll, there will probably be some fabrication of traffic info (such as header info) to make the malware traffic blend in better with legitimate traffic, which also helps us identify network signatures (particularly in the case of poorly-written fake headers). PEview reveals nothing unusual in terms of possible anti-debugging steps (i.e., number of data directories looks fine, no TLS). KANAL detects no known crypto signatures. I saw strings that look like a “normal” set of sections (.text, .data, .rdata, .rsrc) but Resource Hacker wasn’t finding anything. I might try to mess around with this later to rename the sections in the unpacked header, but for now I’m just taking note of this in case it’s useful later. I tried running this sample multiple times, as a regular user and as administrator, both with a simulated Internet connection and on a real one, but absolutely nothing appeared to happen. The packed sample ran and then exited, while the unpacked sample crashed shortly after execution. 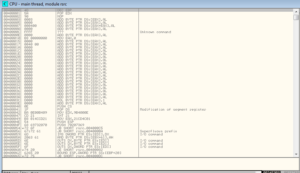 Nothing interesting is coming up in Wireshark, process explorer, autoruns, or anything else. The process monitor data basically shows the malware process being created, some registry lookups (nothing obviously interesting there either), some libraries being loaded, and then the malware terminates. 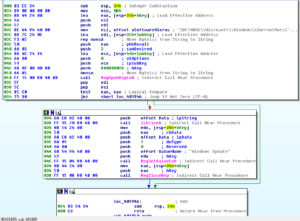 I’ve seen strings that suggest that this malware could run on various versions of Windows, including Windows 7 which is what I’m running in the analysis VM. Perhaps there is an issue with the Windows environment, but at this point I think that there must be some issue with the malware not liking VirtualBox. I’m going to have to look through it in the disassembly and the debugger to see what seems to be preventing this sample from fully executing. Before doing this, I tried a couple of other things. One was I ran the unpacked sample through Import Reconstructor (ImpRec) to see if maybe there was just an issue with the way the import table was set following the unpacking. This didn’t help, the sample still crashes. During a quick glance through the disassembly, and during debugging, I didn’t notice anything checking for artifacts left over from VirtualBox or VMware, but even so I tried terminating all VirtualBox related functions and then rerunning the sample, but it didn’t help. It’s possible that this is just a poorly formed piece of malware that isn’t working right in my environment, but that seems too simple of an explanation, so I need to dig into the disassembly more. 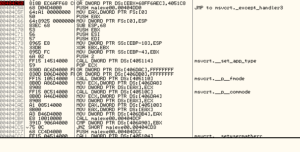 The OR DWORD PTR DS: [EBX+68FF6AEC], 004051C8 instruction doesn’t make sense and immediately starts causing exceptions, which then seems to send the unpacked version into a tailspin. I’ll use the unpacked version just for disassembly, but will continue trying to debug the packed version. This is something I’ll have to come back to someday, as I can recognize that something is going on here but I just can’t figure out what. On one hand, it makes no sense to me that someone would create and propagate a worm that didn’t work. On the other, there are some design decisions in this sample (like hard coding directories, plaintext domains and IP addresses) that calls into question the quality of the construction. I’m going to concentrate on disassembly of the rest of the unpacked file to try to see how the rest of it works. Down below at 404D7F we see the call to WinMain. Getting to the next block at 402F3B, the jump is taken again so I’ll modify the flags and avoid the jump again. Getting to the call to ds:strncpy, the sample again hits exceptions, so I’m just going to through the disassembly and stop debugging completely for now. The code on the right is a bit funny because I did get that to execute successfully in the debugger, and you’d think that a malware author would not want the malware to have error messages pop up. This is one of those examples I’m thinking of when I question the design of this sample. Below all of this, we see a couple more branches but both ultimately call sub 402C30. This sub calls 402050, which reads a file called stm8.inf located in the Windows directory (or we see this being created if it doesn’t exist). After this takes place, we see a call to a sub at 402970 which involves moving lots of data into various registers and then several calls to sprintf to write this stuff to buffers. After those sprintf calls, there are several calls to LoadLibraryA and then several calls to GetProcAddress, so here we’re seeing the sample call several different libraries and functions before moving on to the rest of the code. Again, if this sub fails, then the code exits. The pattern here is pretty much if any of these parts fail to execute successfully, the code will terminate. 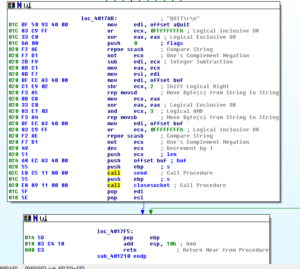 This might help explain why the code appears to do nothing when being executed in the VM. Following the success of the previous sub, there’s a call to WSAstartup (version 2.2 requested) and then the code flows to a call to sub 403BF0. 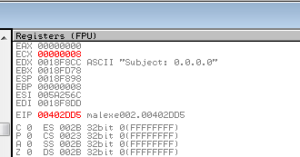 The debugger isn’t following the jump (which leads to another XOR decoding). For now I want to see what’s in the XOR branch so I’ll mess with the flags so we go there. As you can see, it just ends up decoding gmail-smtp-in.l.google.com. Much later on in this branch, we see that string being passed to sub 4031D0. There we see a call to GetHostByName, and if that fails, then the function returns 0 and eventually this branch dies (I’m not connected to the Internet while I am running this instance), but I’ll change the flags and keep this going. Eventually this branch loops back up and runs through the same iterations but for the “alt%d” variations such as alt1,2,etc. All roads seem to lead to location 403E4E, which checks to see if any of the branches leading up to this point were successful or not – if not, we exit. If they were, then we continue on to the hard-coded IP address blocks. You can see the string 74.125.133.26 being moved into EDI, and then shortly after there’s a comparison using that string, and then in my case it moves on to the next string which is 173.1944.68.27, and so on until it finds the IP it wants or it runs through all of them. Then, the return is made to 402C30, which we left a long time ago, it feels. At this point, something weird happens again involving exception handling, and we find ourselves blown out into 7- land (so to speak), but I patched something to get us back to 402C92 which is where I wanted to continue from. We see a call to GetModuleFileNameA (which fails, incidentally) and then a call to GetUserNameA (perhaps to form part of the data used to create the mass emails?) and then the username is passed to strupr to make it all upper case. If this operation is successful, then we skip the rest of this sub. If not, then we go on to decode more stuff and do more things, so I’m going to keep going on this branch. Then after all of this, a call to RegCloseKey and then back to the other sub where we can finally get into crafting some email (I hope)! I also saw the user name string that was converted into all upper case earlier. I accidentally stepped-over one of the subs here at 401E90, but in there you see that and a nested function create and bind a TCP socket and then call listen, looping until the string “google.com” is seen, then back to the previous sub. We see the string “Subject: 0.0.0.0” put in a buffer with a call to sprintf, and some further manipulations of strings. There’s a call to sub 402350, where we see a call to GetHostByName (a deprecated function, according to MSDN, which probably speaks to the age of this sample). If this function fails (which it did in my debugger), then the sub returns, otherwise it builds a string out of an IP address from the GetHostByName call. Soon after this, we see the “Subject: 0.0.0.0\09h\30h\09h\30h” string in its current form being passed to a call to 402170. We get kicked over to a call to 403340, which is a sub that tries to set up some networking with one of the hard-coded IPs mentioned earlier, where we also see a call to ioctlsocket (nonblocking). Unfortunately, that other branch also died, running into exceptions. Perhaps this is because of the patching I’ve done, maybe things are messed up now. I’m going to just try to get back to the SMTP part of the malware and see how that works. Now that I actually got the sample to do something, I’m going to revisit some of the things I would normally try under dynamic analysis which were unrevealing due to the sample not fully executing. 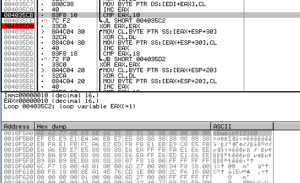 Taking a look at Wireshark, there actually was almost nothing that seemed like it could have been attributed to the malware except for a DNS resolution to alt1.gmail-smtp-in.l.google.com which was something that was observed when I was forcing execution through the debugger. I suspect that the reason why there isn’t any SMTP traffic being observed is that while I was forcing execution of the malware in Ollydbg, networking was never completely started via a successful call to WSAStartup. Other than this, nothing else interesting came out of RegShot. Process Monitor also didn’t have anything interesting in it, apart from what was already discussed above. This was a weird sample to work on because of the issues getting it to run. I don’t have a dedicated physical testing system, otherwise I would have tried it on there to see if I could get it to run properly. I’m torn between whether this was a very sophisticated sample that employed anti-VM techniques that I couldn’t detect (like the SEH shenanigans referenced in the post) or if it was just not well-written and this was causing the execution issues. Just because I didn’t find something doesn’t mean that it wasn’t there, but on the other hand my opinion is that there were several questionable design decisions throughout the sample, so… Not sure on this. 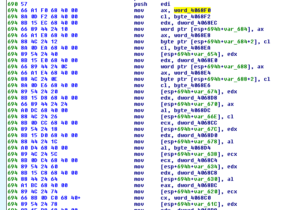 This type malware appears to be very old. I’ve seen references to this worm going back as far as 2002, so perhaps this would help explain some of the execution issues also. I didn’t see anything obvious as far as how the malware gets its email addresses to mail to, however we did see many examples of what appear to be bad passwords hard-coded in the sample. My intuition is that this program tries to harvest email addresses from the host computer. I didn’t see any C2 functionality in here, so I suppose this is sort of a fire-and-forget piece of malware. This sample doesn’t appear to have any clear goal in mind, so maybe it was created for its own sake. 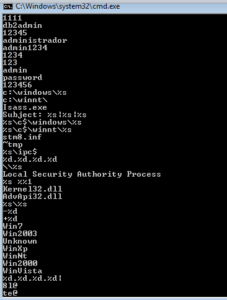 Persistence is attempted via the registry and creating a copy of itself (Isass.exe) that is meant to resemble the lsass.exe file. Persistence wasn’t fully achieved, probably due to the malware not functioning correctly as I forced it through the debugger. I also didn’t see any movement of this sample through a network (or really anything like this in the code), though again, the sample wasn’t functioning 100% so I’m not sure it’s wise to completely rule it out. Finally, it seems that Pepex is a fairly consistent name for this sample, so no need to name it like I did with BEAR. 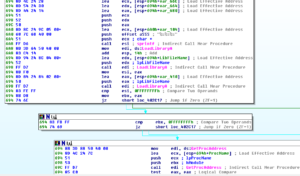 Mass-mailer worm with execution issues. Design flaws reveal functionality and signatures. This sample was first observed 14+ years ago, but doesn’t seem to have any obvious malicious function besides wasting resources. Detection is very high for this sample, probably due to age, so up-to-date AV probably would help mitigate this sample. Not opening suspicious files received via email or other routes also stands for this sample. Use of strong passwords (and definitely NOT the very poor examples found in this malware) is advised. Removal can be done by modifying the registry entry for persistence (if successful in the first place) and also the Isass.exe file. Interesting to see this very old piece of malware, even if it didn’t fully run in the test environment. Not a terribly destructive sample, mostly just annoying.